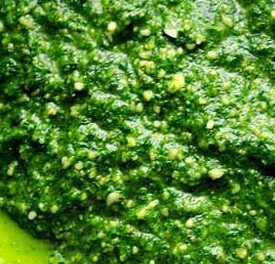 Pine nuts can be pricey, so try making your next batch of fresh pesto with with mixed nuts! Price friendly alternative to the traditional pine nut pesto, this version is made with ½ cup of roasted almonds, walnuts, cashews, and peanuts. Leave the olive oil on the side, but add all ingredients to your food processor. Chop until fairly smooth and slowly add the olive oil until it reaches the desired consistency.